With the start of a new season we are happy to announce that we have a new album and some shows. All of the usual nonsense and musical noise from at least three of us at each show. The new album featuring many of the songs from the current set is available now on CD. 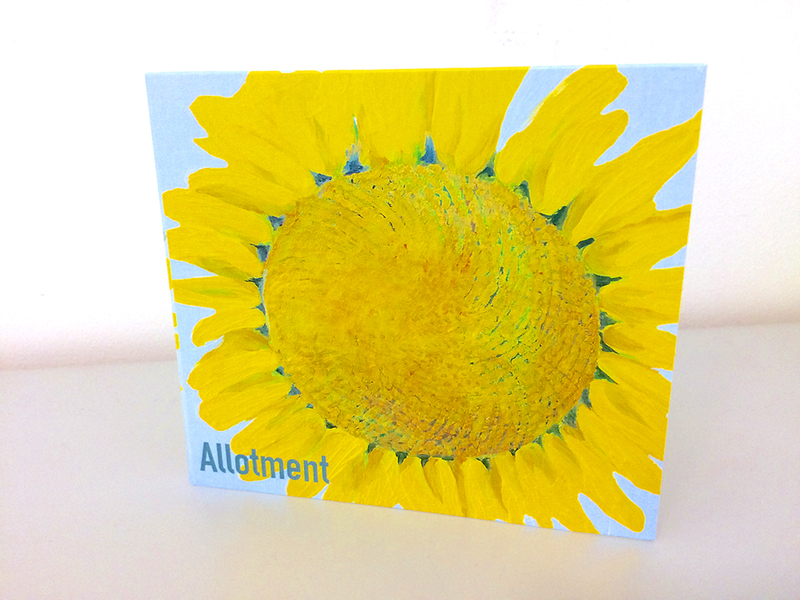 http://www.allotmentmusic.co.uk/wp-content/uploads/2015/11/Allotment_Standing_Still_Dance_Music_Cambridge.png 0 0 The Music Grower http://www.allotmentmusic.co.uk/wp-content/uploads/2015/11/Allotment_Standing_Still_Dance_Music_Cambridge.png The Music Grower2017-10-05 10:00:002017-10-05 10:13:03Autumn Season - Where are we playing? 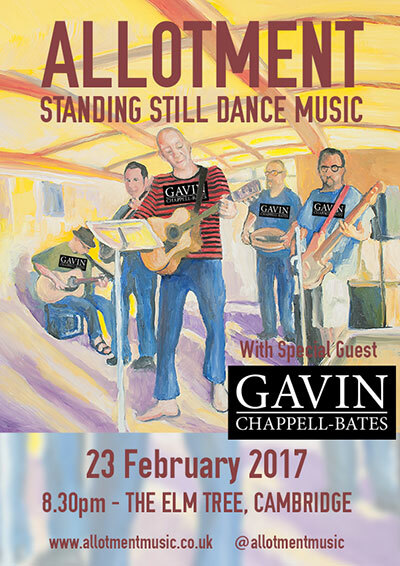 Looking forward to our gig at The Elm Tree in Cambridge next week, Thursday 23 February, this time with Gavin Chappell-Bates. We are at it again, more standing still dance music nonsense from Allotment, back at The Elm Tree in Cambridge for another evening of unplugged tunes, this time with the ever groovy Gavin Chappell-Bates, we saw him in on a rainy Saturday afternoon on the back of a lorry in Melbourn, was good then, will be good again. 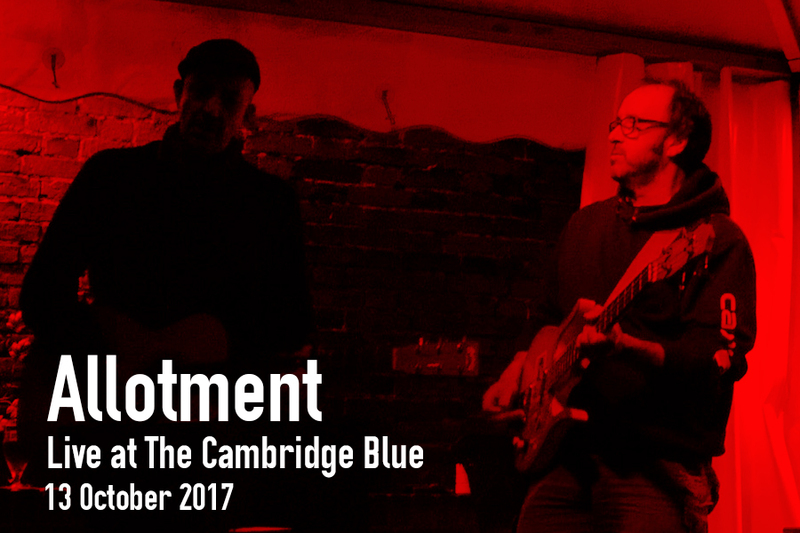 Thank you to everyone who came down to The Elm Tree in Cambridge to see Allotment play with Eva’s Dream, it was a great evening with some excellent beers and old friends, some new too. Ross managed to control the camera well enough to get some nice video, here is the first of many, Staines Morris. 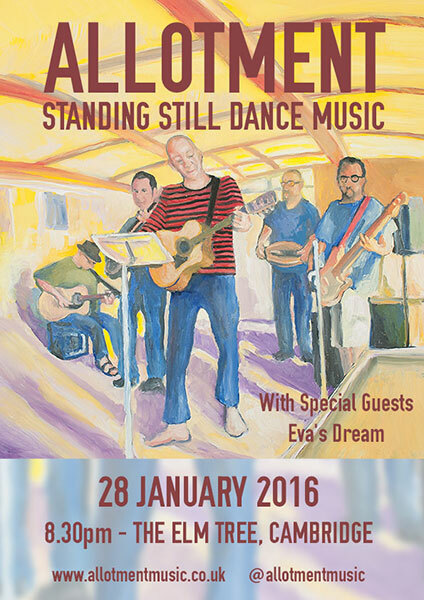 It’s 2016 and we are kicking off our year of gigs and sessions with an evening at The Elm Tree in Cambridge. Starting at 8.30 we are assisted by the great Saffron Walden band Eva’s Dream. Hopefully some of the gig will be recorded so we will be posting the best bits here soon.